A variety of economically valuable fishes, invertebrates and marine mammals associate with offshore oil and gas platforms. The presence of this marine life invites the question as to whether or not platforms are producing life or merely attracting life from other habitats. This is an important question, because through the Rigs to Reefs (R2R) program, California's Department of Fish and Wildlife can permit waivers that keep the platforms in place if they are deemed necessary for the conservation of marine life. In California, the R2R program is an active example of an artificial habitat with the potential to mitigate anthropogenic losses and degradation of natural habitats. 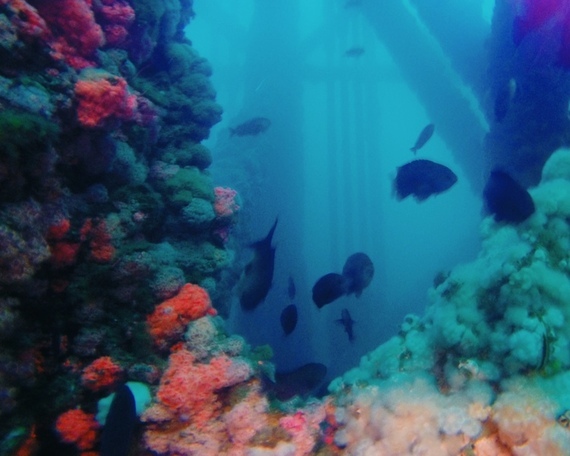 Artificial habitats are prevalent in coastal areas threatened by a range of anthropogenic stresses, including overfishing, pollution, mining, coastal development, and climate change. They offer an opportunity to enhance local marine biodiversity and fisheries without addressing the actual anthropogenic pressure or the trajectory required to naturally achieve enhancement of biodiversity. Basically, these artificial habitats essentially act as Band-Aids for the deeper-rooted issues of human stresses on the marine environment. They provide a controllable solution to cover up the issues of habitat destruction, pollution and overfishing by providing additional habitat and allowing fish populations to rebound. However, they don't actually address the long-term and recurring issues of human impacts that continue to plague the oceans. Follow us on Instagram @rig2reefexplorers.